In 1943, the Reserve Bank of India got its first Indian governor in Chintaman Dwarkanath Deshmukh, a civil servant luminary who went on to do a great many things for the country in the early years after Independence. Deshmukh’s appointment to the independent regulatory body came at a time when India was ruled by the British, and predictably in the face of opposition from various sections of the government who wanted the tradition of a European helming the central bank to continue. But he battled all these odds to become the third governor of RBI. What worked in his favour was his long association with the bank. 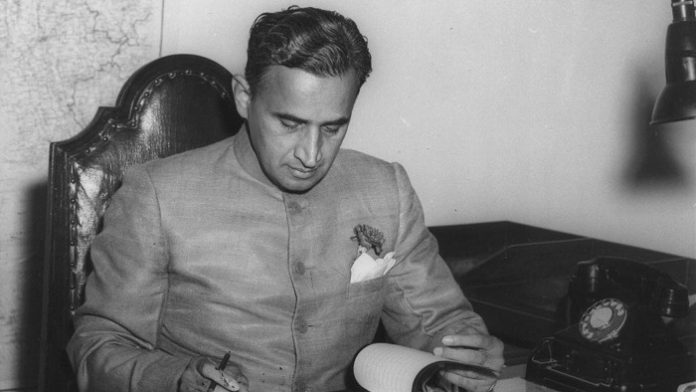 Deshmukh was appointed as a government director on the bank’s board and subsequently held the posts of secretary and deputy governor before being elevated to become a governor. His association with the central bank did not cease after he demitted the Governor’s office in 1949. Deshmukh was later appointed as the union finance minister marking a 17-year long association with the central bank. On his 123rd birth anniversary, ThePrint takes a look at the life of the civil servant who served the country in various capacities. Deshmukh’s tenure at RBI was not an easy one despite being closely mentored by his predecessor James Taylor. When he assumed charge, the Second World War was raging and he had to counter the high inflationary fallout of a war. A perusal of the Deshmukh’s comments and speeches during the time shows that tensions between the government and the RBI are nothing new, especially with the British government’s distrust of an Indian governor. RBI’s archives chronicle that how for some weeks after Deshmukh’s appointment, the Finance Department went so far as to suggest that in every important case the governor should also ascertain the opinion of the managing director of the Imperial Bank. This practice was, however, abandoned soon “when they found that in no case was the second opinion different from mine”, Deshmukh is quoted to have said in RBI’s archives. “It is notoriously dangerous to change horses in mid-stream, and the anxiety of the Finance Department to ensure that the new mount would not sink with them in the stream was understandable,” said Deshmukh. Born on the auspicious day of Makar Sakranti (14 January) in 1896 in a village in Maharashtra’s erstwhile Kolaba district, Deshmukh excelled in Sanskrit and English early on. He went to London to prepare for the Indian Civil Services Exams. He appeared in the open competitive exams of the Indian Civil Service in 1918 and emerged as the topper. In his autobiography titled The Course of My Life, Deshmukh wrote about his examination scoring pattern — he scored 3520 marks out of 5900 and stood first despite a deduction of 60 marks for bad handwriting! He met his first wife Rosina while undergoing probation for ICS and married her in 1920. They had a daughter, Primrose. After Rosina’s death in 1949, he married his second wife Durgabai, a well-known freedom fighter and social activist. After returning to India in 1920 to start his administrative career, Deshmukh also briefly toyed becoming a part of India’s freedom movement but was dissuaded by Bal Gangadhar Tilak who advised him that India will need able administrators once it attains independence and assured him that that day was not far. He went on to become one of the top administrators in India and was conferred knighthood in 1944. After India attained independence, Deshmukh was appointed as one of the members of the Planning Commission in 1950. He went on to become the finance minister the same year and was closely involved with drafting of the first and second five year plans. The setting up of State bank of India after nationalisation of some banks, the setting up of the Life Insurance Corporation of India and nationalisation of insurance companies happened during his tenure as the finance minister. Deshmukh’s contribution and stature was such that RBI hosts an annual lecture series under his name. So does the National Council of Applied Economic research. He also served as chairman of the University Grants Commission between 1956 and 1961, and later as founding chairman of the National Book Trust. Deshmukh died in 1982, a year after the death of his wife Durgabai. We had a very tangential exposure to the great man. His brother B. D Deshmukh was Collector of Central Excise, Allahabad, proceeded on three months’ leave. Father was posted in his place, in the summer of 1965. Not knowing this was a leave vacancy, we landed up, bag and baggage, stayed in a bungalow opposite Anand Bhawan. Huge sheets of khus, watered all through the day, kept the rooms cool and fragrant. The best part was criss crossing the state, Naini Tal, Ranikhet, Almora, Rae Bareilly, which we would reach in time for breakfast, Mirzapur. Staying in beautiful Circuit Houses; in one, the staff remembered Nehruji being a visitor.